Dr. Pat Curley is on the staff of NC State University’s Science House, and serves as Director of K-12 Outreach at CMAST. 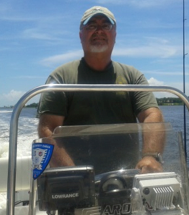 As a certified NCDENR Environmental Educator, Dr. Curley promotes the use of hands-on environmental based learning. He has been recognized for excellence in environmental education by state and national organizations and was named as Outstanding Practitioner by the Environmental Educators of North Carolina in Fall 2013. Pat retired from the Marine Corps as a Gunnery Sergeant in 1996 after serving 20 years in the infantry. He is a Gulf War and disabled veteran. Pat used his GI Bill to receive a BS in Liberal Arts from Regents College, a MAEd in Science Education from ECU, and graduated with an Ed.D in Educational Leadership and Administration from UNCW. Pat served as a teacher and instructional coach for Onslow County schools from 2002-2013.